Everyone loves a campfire. Sitting around the soft, flickering light while the cool evening nips at your back. Enjoying the company of friends and family while sharing stories and roasting marshmallows. Campfires can be the exclamation point at the end of a fun-filled day. But the last people you want to see at your campfire are Wildland Firefighters. 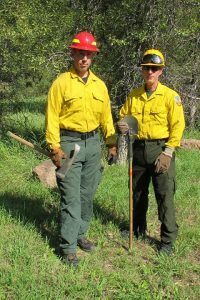 You don’t want your campfire to result in uninvited wildland firefighter guests. The National Park Service estimates that more than 90% of wildland fires in the U.S. are caused by humans, and the majority of human-caused wildfires are the result of unattended or uncontrolled campfires. Campfire safety begins with knowing where and how to build a safe fire. Check for any fire restrictions or fire bans in the area where you are. Keep in mind that fire conditions may change and that parts of the US (particularly in the western states) tend to be dry, which can increase fire danger. Even if there are no fire restrictions, if conditions are extremely dry or windy, campfires can be extremely hazardous and common sense dictates erring on safety and not having a campfire. If your campsite already has a fire ring or pit, use it. 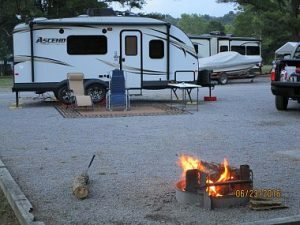 Be sure that your tent, walls, trees, or shrubs are at least 15 feet away from the fire pit. Do not locate campfires under low-hanging branches. Try to keep campfire locations in areas that are protected from the wind. Use a level ground location, and clear away any fuels like dry grasses, logs, brush, and leaves within a 10-foot diameter of the fire pit. Store firewood upwind and outside of the 10-foot clear area. 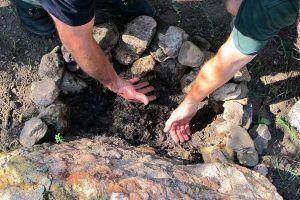 The pit should be about a foot deep in the ground and ringed with rocks, cinder blocks, metal, or other non-combustible material. Make sure you have a plentiful source of water, a bucket, and a shovel nearby at all times when you are having a campfire. Burn only wood in the campfire. Do not burn trash, bottles, cans, batteries, or other non-wood items as they can explode or release toxic fumes, which can harm you, your loved ones, and the environment. Paper trash can become airborne from the heat of the fire and blow beyond your cleared safe zone, possibly starting a spot fire. Keep your campfire reasonable for the environment and conditions. Many areas restrict your campfire size to no more than 3 feet by 3 feet by 2 foot high flames. Dry or windy conditions are cause for smaller fire sizes. NEVER leave a campfire unattended—not even for a minute. After you are done enjoying your campfire, it needs to be properly extinguished. Feel with the back of your hand that there is no heat left in the ashes. If possible, allow the wood to burn completely to ash under human supervision. Test to be sure the fire is out by touching the back of your hand to the ash pile. If you feel ANY heat, it is not entirely out, and you need to repeat the water-stirring routine some more. Do not leave a campfire that is hot or warm to the touch! How do you know if the campfire is all the way out? If it is COLD, DEAD, OUT. There are some great alternatives to campfires! 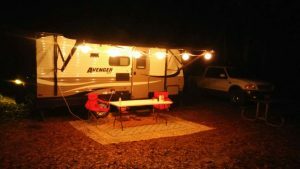 There are options ranging from portable propane fire pits to flameless campfires using solar lanterns, chemical light sticks, or battery operated light strings. You may also like Camco’s Little and Big Red portable campfires. FYI Propane tanks vent to atmosphere. Propane is extremely flammable! One small spark is all it takes.